Benghazi and riots: Why America must defend even the ugliest free speech. 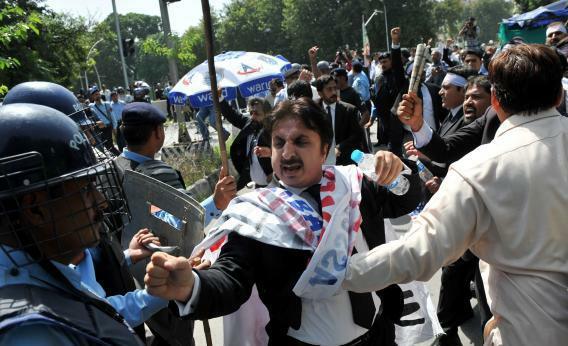 Pakistani riot policemen hold back lawyers shouting anti-US slogans as they attempt to reach the US embassy in the diplomatic enclave during a protest against an anti-Islam movie in Islamabad on Sept. 19, 2012. At the annual meeting of the U.N. General Assembly this week, plenty of voices will be heard, including that of the hateful president of Iran, Mahmoud Ahmadinejad, and not one of those voices will be censored. Rarely has the value of free speech been so threatened. The arc of the unfortunate story is now well-told: Using a perceived attack on the Quran by a private voice as a pretext to ignite anger, forces of intolerance incite riots against visible American interests and representatives, usually causing damage of some sort, and in the recent incident in Benghazi, leading to a tragic loss of life. How should we respond, both to the initial provocation, and then to the assault on U.S. interests? We should be clear in understanding that these attacks are the price we pay for believing in free speech, especially in a world where such tolerance is not universally accepted. We are used to dismissing as cranks and crazies the fringe voices who preach everything from anarchy to conspiracy, or who feel compelled to elevate their own religious or political views by speaking in venomous terms about those of others. Yet in parts of the world where free speech is not an accepted part of the political or social fabric, such speech can be exploited by those with multiple motives. As Bill Keller points out in today’s New York Times, it is often the intent of those causing the riot that tough restrictions on speech be imposed. The very violence they cause becomes the argument they can then use to stifle opposition voices. All of which brings me to a simple point. If we appear at all queasy in our dedication to the founding principle of free speech and tolerance for that right in others, we give sustenance to those who would squelch it. We also weaken the overwhelming long-term appeal our principles have in those nations now going through a tumultuous upheaval. Of course we cannot expect the end result to be universal adoption of our vision of freedom, but if we waver in defending it as a principle, then we will give up hope that we can move toward that goal. We have learned well that it is in defending the ugliest speech that the principle of free speech is vindicated, and that point must be articulated even in those lands where the concept may now seem foreign. In nations where the voices of intolerance are most visible and momentarily powerful, it is in our long run interests to remain firm in our clear articulation that the use of violence in response to speech is to be condemned. The rise of democratic voices and free speech in huge parts of the world is a direct consequence of the fact that we have been willing to condemn such violence. So rather than apologize for legal speech, we should say simply that legal speech within our borders is neither endorsed nor condemned by the government, and the use of violence elsewhere in response to speech will not and cannot be tolerated.